Are you looking for ways to connect with your learners on a more personal level? This article explores the benefits of using characters in eLearning, and highlights eLearning character types and some of the top tips that can help you create more dynamic and emotionally-centered eLearning courses. Self-paced asynchronous learning has many advantages, but it may sometimes turn impersonal. Fortunately, there is another way to add that all-important human element to your eLearning course: Characters! A well-chosen cast of characters can take on unique personalities that help learners connect to the subject matter and make your eLearning experiences unforgettable. In this article, we'll explore the benefits, types, and tips for using them in your next eLearning course. Online learners can relate to an eLearning character more effectively than they can to a block of online text or graphic. The eLearning character interacts with them directly, which fosters an emotional connection between themselves and the subject matter. This also leads to an increase in learner motivation and engagement. Creates a sense of cohesiveness. Rather than having disjointed eLearning modules or activities, you can add an eLearning character who ties all of the information together. eLearning characters are able to direct learners to the next online lesson, compare and contrast related ideas, and show the connection between each of the eLearning modules. eLearning characters help to create a more positive and supportive online learning environment. When learners actually enjoy themselves and are inspired to learn, they are more likely to remember the information. eLearning characters make all of this possible by offering a helping hand and some much-needed guidance during the eLearning experience. This eLearning character offers guidance and support for the learner throughout the entire eLearning course. They may tell them which online activities they should complete next or remind them of their progress periodically. eLearning course guides are ideal for beginners who may not be familiar with the LMS and need some extra assistance until they learn the ropes. An eLearning character who is on the same level as the learner and trains right along with them. This eLearning character type tends to be more conversational and somewhat resembles the audience. For example, they might be wearing the same uniform or be within the same age group. An expert in the field who serves in an authoritative capacity. They offer tips throughout the eLearning course and explore subtopics or ideas that the online learners may find useful. Experts can also be "wizards" that online learners have the option to click on when they need more information. Royalty free images are a great resource for eLearning characters. This is particularly true if you don't already have photos from the workplace or need to get more creative with your eLearning character design, such as developing cartoon or comic-based characters for eLearning. Some eLearning authoring tools even have built-in asset libraries where you can find images, backgrounds, cut-outs, and a wide range of other royalty free media to use in your eLearning course design. Create a cast of clickable eLearning characters. Instead of just creating one character for your eLearning course, why not give your learners a whole cast to choose from. This offers them the chance to select an eLearning character they can truly relate to or empathize with, rather than having to go with a "generic" eLearning character. Sit down with your eLearning development team and brainstorm the personalities, traits, and appearances of your eLearning characters. Create a mini-backstory for each, such as their main concerns, goals, and anything else that can help your learners build a connection. Just make sure that you don't go into too much detail, as this will only complicate the process. It can also lead to eLearning characters that are so specific that only a handful of your learners will find them beneficial. Every eLearning character you develop for your eLearning course should be realistic and relatable. For example, you don't want to create a business character that wears jean and a T-shirt if you are trying to convey a sense of professionalism. So, research your audience to determine how each eLearning character should look and behave before you start your rough sketches. In a corporate setting, surveys and workplace observations are ideal evaluation methods, as they give you the opportunity to explore the background of your corporate learners and the organization, itself. Ensure everyone's on the same page. Host an eLearning character development meeting in advance to make certain that every member of your eLearning team is on the same page. Make them aware of how many eLearning characters you'll be using, their backstories, personalities, and any other pertinent information they should know. 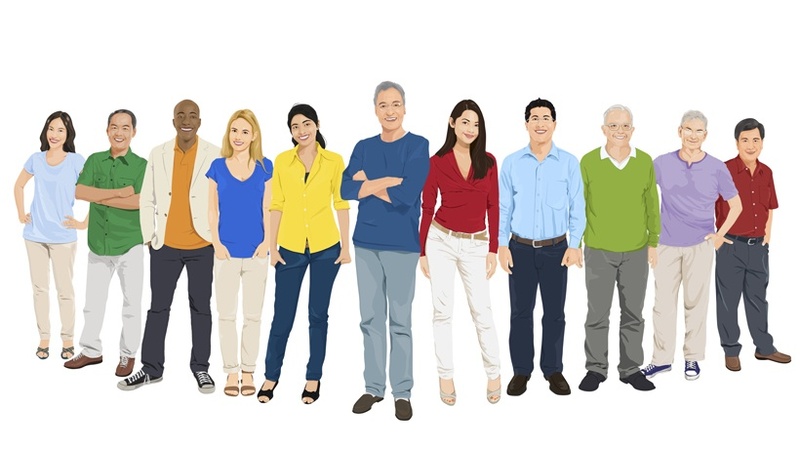 You may even want to create an eLearning character diagram that features every member of your virtual cast, as well as how they fit into the eLearning course design. For example, you should indicate that "Charlie" will be the star of the third module. Use this article as a guide to develop engaging eLearning characters that guide your online learners through the eLearning course and offer them jewels of wisdom along the way. Also, bear in mind that eLearning characters are no substitute for genuine peer-based eLearning feedback. Thus, you may want to consider integrating group collaboration activities into your eLearning course design. This is particularly the case for self-guided learners who may need extra motivation and social interaction. eLearning characters and storytelling is a winning combination. Read the article 7 Tips To Integrate Storytelling Into Your Next eLearning Course to discover how to create a highly effective and engaging eLearning experiences for your online learners.